The mortadella pizza at Cupola Pizzeria. Photo courtesy Cupola Pizzeria. Looking for some old-school prices? The happy hour at ~SAM’S GRILL AND SEAFOOD RESTAURANT~ is here to remind you of the good old days with their Throwback Thursdays Happy Hour every Thursday from 4pm to 6pm. Your second beer will be priced at a retro $0.50, glasses of wine at $1, and Manhattans are only $2 (you’ll pay full price for your first round, though). It all kicks off this Thursday March 12th. Every Monday, ~CUPOLA PIZZERIA~ will be offering half off all bottles of wine. Their wine list includes plenty of Italian and domestic offerings, including some sparklers. 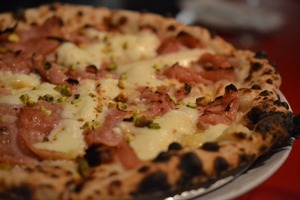 Plus, they’ve always got good pizzas, including a new mortadella pie with mozzarella, pistachios, and of course, mortadella. Now that ~BOXING ROOM~ has a full liquor license, they are offering a Half-Price Highballs Happy Hour (hello, alliteration) Monday through Friday from 3pm to 6pm. There are three highballs to choose from, including the #1: mezcal, super celery soda, and lemon. There will also be half-price oysters, Abita Amber for $3.50, wine on tap for $5.50 a glass, as well as some additional snacks. A victorious bartender at Speed Rack 2013. Photo by Jonathan Fong via Facebook. Celebrate female bartenders in all their badassery on Sunday March 15th from 4pm-8pm at the fourth annual Speed Rack competition. The competition pits local female bartenders against one another as they shake up rounds of cocktails for a panel of judges. Contestants will be judged based on the accuracy and speed of their mixing skills, and the winner will head to the national finals in New York to compete for the national championship. All proceeds from the event go to benefit breast cancer research, and to date they’ve raised more than $250,000. Holla! Tickets are $20 in advance or $25 at the door, and include samples of cocktails from sponsors and snacks from local restaurants. For an additional suggested donation, full-size cocktails will also be offered, along with food from a La Cocina food truck. Contestants include such fab ladies as Karri Cormican (Comstock Saloon), Claire Michelle Sprouse (ABV), and Lauren Steele (Nopa, Liholiho Yacht Club). The event is held at Pubic Works, in SoMa. 161 Erie St. at Mission. 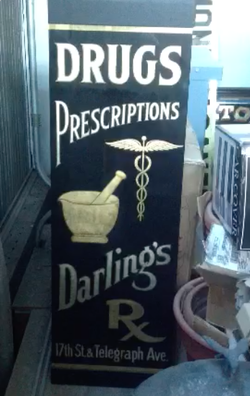 The original Darling’s sign. Photo courtesy of Bar Dogwood. Almost exactly a year ago, we reported on Uptown’s Bar Dogwood expanding into the space next door and opening Darling’s, which is now going to be ~DARLING’S ELIXIRS~. Owner Alexeis Filipello is paying homage to the space’s former existence as Darling’s Pharmacy in the 1920s, so expect some pharmacy-inspired style and cocktails. On the menu: housemade phosphates, lactarts, and other old-school soda jerk-inspired adult drinks. While it’s primarily reserved for private events, it will be open as a bar Thu-Sat. The official opening is this Friday March 13th. The entrance is at 1635 Broadway at 17th St., Oakland. Meanwhile, over in Emeryville, the couple behind CommonWealth Café and Public House have just opened ~COMMONWEALTH MICROPUB~ (in the former Café Biere). East Bay Express notes there’s just table service (no bar), and there are eight beers on tap, two ciders, and quite a menu, from miniature Yorkshire puddings to mulligatawny soup. Open Tue-Thu 4pm-11pm, Fri-Sat 4pm-12am, Sun 4pm-10pm. 3896 Adeline St. at 40th, Emeryville, 510-858-5122.